Theological Foundations of Law. Lt. Col. (Ret.) Eidsmoe discusses the complexity and sophistication of the law throughout history and how those laws recognize the existence of a higher power. Transcription note: As a courtesy for our listeners’ enjoyment, we are providing a transcription of this podcast. However, as this is transcribed from a live talk show, words and sentence structure were not altered to fit grammatical, written norms in order to preserve the integrity of the actual dialogue between the speakers. You’ve found yourself at the intersection of faith and the culture. This is WallBuilders Live! Where we’re discussing today’s hottest topics of the day on policy, faith, how those things affect the culture. We are always looking at them from a from a Biblical, historical, and constitutional perspective. Those 3 things will get you to the right answer if that is your perspective. Your hosts are David Barton, America’s premier historian, Tim Barton, national speaker and pastor. And my name is Rick Green, former Texas state representative. You can find out more about our organization at WallBuilders.com and also WallBuildersLive.com and of course, guys, we’re often talking about founding principles, constitutional principles, but sometimes we go back before the Constitution and talk about how they got to that point. And later Colonel John Eidsmoe is going to be with us to talk about his new book that dives into exactly that. But what we’re really talking about are timeless principles. What history has shown to actually work. You know principles are things that do not change across time. And that’s such a hard concept for so many people today to get because our technology and everything around us changes such a rapid rate that we really don’t have the anchors we used to have. We’re at a point now where the two out of three Christians don’t believe that there is absolute moral truth. Eight out of ten Americans don’t believe that. So we’ve moved away from really having fixed points that are immovable. I mean things that do not change do not move across time. We’re so poor on science and history and other things we just don’t recognize that. And you really hit the key there, it is principles. To try to get people to identify key principles, that’s hard for them to do they can identify elements, but not principles. What are the five principles that made America great? What are the seven immutable things that never change? I mean if you start ask that, that would be like, “I’ve never heard this thought before.” And it is those principles and foundations that if you don’t get them nailed down, you get moved off of them really easy. One of the things, let me throw out there that I heard a few weeks ago around Thanksgiving was you were on a TV show and you were talking about it is significant that when you look at America and the principles America was formed on, really many of those came to America with the Pilgrims. However, the Pilgrims came and 1620. America was “discovered” a long time before 1620, but it wasn’t really established. We didn’t start seeing immigrants coming over in the numbers to really form colonies and settlements that we did until really 1620, going forward. And one of the things you pointed out is that really up until that point, we didn’t have people that largely knew the Bible and knew those fundamental immutable truths those Biblical principles. So if we had been formed as a nation before the Pilgrims we would have a very different ideology as a nation. We would have been established very differently and arguably would look very much like many of the European nations with some of their instability and chaos and issues and not enjoy the things that we’ve enjoyed as Americans. So largely you can point back to the Pilgrims, but the reason the Pilgrims were significant is because they were learning some of those Biblical truths some of those immutable principles. Now the Bible is back in the language of common man and the Pilgrims are taking this Geneva Bible and they’re living day in and out learning these truths, using it as they establish their education laws and their civil rights laws and their economic system. The Bible shaped what they did and ultimately shaped what then even the Founding Fathers did with the Declaration and the Constitution. But it’s significant that the Pilgrims were the ones that largely brought these ideas. But America wasn’t even really established before the Pilgrims, who were the ones who brought those ideas. And he said something that was really important there as well. The Pilgrims were studying the Bible and learning the ideas of free enterprise, the Biblical ideas of criminal justice, of education, of private property, and good relationships with Indians. They were studying the Bible. So who was studying it? It wasn’t just their governors. It was every single one of them, every citizen. And we’ve really come to a point in time where that citizens don’t think they need to know all the principles anymore as long as the experts know it. You know we’ve got Supreme Court justices that know it, “I don’t need to know the law.We’ve got professional educators our I have to know education.” And so we’ve really gotten this thing of deferring to the experts and we no longer know our self these principles. So we’ve got a pastor, a lawyer, a doctor, we’ve got all these people in these positions. But if you look back generations or centuries ago, you didn’t have those quite same qualifications and especially not in early America where they studied law. They studied, by the way, based on the Bible. Go back to Black Stone the laws of nature, nature’s God. And this is where it originates from and and really all Western civilization based on the Ten Commandments. Well, they studied because they were the ones having to do things. And you’re right, so often today we relegated or even delegate that responsibility to somebody else saying, “You know what my pastor is going know the Bible for me. I can pay a missionary to go reach people in other nations. I can pay the government to do this and then welfare will take care of this.” And we really have shifted responsibility from our shoulders and given to somebody else when that really shouldn’t be what we do. If you look at the way God did it, it’s interesting that when he brought his people out of Egypt at 400 years in slavery, when he’s bringing them out he’s not leading out a bunch of doctors and attorneys and schoolteachers. And so from the poorest and the meanest to the absolute top of the food chain, Moses and Aaron, their deliverers, their leaders, everybody learned God’s laws, without exception. And they learned the civil laws, restitution, immigration, military, and every single one of those Israeli citizens learned the laws. And that’s the model God wants. How many different times they keep coming back and repeating them? That repetition and that constant learning them over and over again and coming back to it. Kind of like what we need to be doing with our history and our laws. And that’s one of the things that Dr. John Eidsmoe helped us do. And you called him Colonel before and you can call him that. He’s got so many higher ed degrees. I don’t know how many he’s got. It’s probably like five. He’s been head of a federal law school. He’s a constitutional law professor. He’s done so many things and his education has not moved him off of his principles and that’s a unique thing about him. He was so grounded in principles that his education helped really enhance that with knowledge. But it didn’t move him or change his values. And so one of the things he’s done is he’s gone back historically and said, “You know, there are principles and there are ideas and they’ve existed now for really the 5,500 years of human history, that 3,500 years of written history.” And he’s gone back through and identified those. And it is these things that early Americans used to study. It’s like the Israelis when they gathered around the mountain and God gave everybody the law. It used to be that in America. Everybody read the law books, studied the government books, and knew something about all of these areas. And so he’s created a three volume set that is called the “Historical and Theological Foundations of Law.” And if you get that down you understand what works and what doesn’t work. And not just in government, but in business, and in education and everything. Because these are the immutable principles. And so we offer these three books through WallBuilders because we think they’re so good that every citizen should know them. Kind of like the Committees of Correspondence back and 1772 when patrons are putting out all this information for all the citizens to read. I mean, this is one that everybody needs to read and know. And John Eidsmoe’s one of the best in the world at bringing these principles down where everybody can read and understand them. He’ll be with us when we return. Stay with us you’re listening to WallBuilders Live. With so many entertainment choices, it’s hard to know what TV programs and movies embrace your family’s values and are safe and friendly to your faith. That’s why we created Dove Channel. A digital subscription service that offers trusted wholesome programming for the whole family. Dove Channel is proud to present its newest series, Chasing American Legends. Join Rick Green and his family as they travel the country to rediscover America’s national treasures. Explore new places with this 12 episode series. Log into Dove Channel every Friday for a new episode. Subscriptions are just $4.99 a month and is available right to your favorite devices including Roku, computers, tablets, and smartphones. Go to DoveChannel.com and subscribe today. Welcome Back! Thanks for staying with us here on WallBuilders Live. Our guest today is our good friend, John Eidsmoe, retired lieutenant colonel. He’s a professor and also a constitutional attorney. He’s authored 12 books and a new one out now called “The Historical and Theological Foundations of Law.” Always good to have you, Brother. Thanks for coming on. Great to be with you and thank you for all the work you and Dave are doing there at WallBuilders. You’ve done a tremendous job of waking up our nation to our heritage. Well right back atcha. You do a lot of that as well and now and publishing this really nice set of six books, a set of a couple of volumes now on literally the foundations of what we’re talking about when we talk about law and our theology and what led to the American Constitution. Exactly. It is three volumes and six books, there is two books in each volume. The series really ends with the Constitutional Convention of the Founding Fathers and goes back to what happened before with Biblical law, with the law of the various other nations as they might have had some echoes from Eden, some wisdom of divine law from the beginning. And part of what I try to do here, I had been thinking the Darwinian Theory that law has evolved from the simple to the complex and they have all their theories about how this happens. But when you look to history it just doesn’t work that way. And in the book I’ve devoted chapters to the Mesopotamian systems, to the Egyptians, to the Persians, India, to China, to Polynesia, to American Indians, from the Maya, and the Inca, to the Aztecs, and even the Cheyanne Confederacy, and the Iroquois Confederacy all of which demonstrate two things. Number one, that ancient law was sophisticated and complex. And if anything degenerates thereafter. And number two, that every one of these ancient societies attributes this law to a higher power, to God, to the gods, the Dao, whatever they wish to call it. And the modern idea that law is simply man made is a 20th or 21st century aberration. So it’s not just that the laws of Christianity produced a great nation. It’s is all of these former systems of law recognized God, that there was a higher being. And this movement towards, “We just make this up as we go in whatever feels good.” That’s what’s really dangerous. Exactly. But in the first volume, we devote a full book, many chapters, to the subject of the Hebrew law. And the Hebrew law is different, because in these ancient societies, they are trying to recall what maybe the original revelation of Enid was and they’re trying to discover God’s law in this way. But for the Hebrews, God’s law was revealed to them and the laws of Moses and their institutions reflect God’s direct revelation. So as we go on through the Greek and Roman systems that we looked at the aberration of Islamic Sharia law, we see the development of the common law through its Celtic and Anglo-Saxon and Viking roots onto the Norman period and then coming up to the Lutheran and the Calvinist Reformation. And then the influences of these great thinkers, that the Founding Fathers read men like Blackstone, and Modest Q, And Locke, and so many others. We find that the Founding Fathers, well they were men of genius and men of Christian convictions. They didn’t just come in there with a blank slate. They had a backdrop of thousands of years of men dealing and wrestling with the principles of God’s law. So this is what they could rely upon. And that’s what this three volume set is intended to do, is to show what that background was and help us to understand where the Founding Fathers were really coming from. So this is almost like going through a journey of this history the same way they would have done. I mean they were students of exactly what you’re producing in these volumes. Very many of these writings that we have here, they would have been very familiar with. Now some of them, more so than others. And not all of them would have been going through the laws of the Egyptians or the Mesopotamians in ways that we have here. Not all of them were familiar with the Iroquois Confederacy, although Ben Franklin was and a few others were. But the basic train of the common law as it developed in England and its German roots before that, and the Biblical law itself. Yes, they would be familiar with this directly and indirectly. And this is designed to give the reader an idea as to where they are coming from. Part of the reason that I wrote this is, it just looks all of this is fading into memory and then memory itself fades. And if we were to enter a day where we have nothing but humanistic and socialistic legal systems in our country and in our world the day may come when everything collapses and people are looking for some answers. I developed a series of books for a timeless record to give people the answers when they’re ready to turn to them. And frankly, with the results of the last election it looks like we may have an opportunity to turn to them once again a lot sooner than I was afraid of. That’s exactly what I was thinking as you were saying that. As you know, yes, it’ll be there if things go you know as bad as they very well could go. But the good news is if we’ll turn to this stuff right now, which people tend to be more interested than I thought. Colonel, I used to think most people aren’t going to be like you and me and you know, sit around and talk about this kind of stuff. But more and more people are. I mean, this is not just for people that are in law school or that live in the political realm like some of us. This is for anybody that wants to be a good citizen and understand what makes a good society. Absolutely, is designed for pastors or lawyers, of course, and lawyers will be a good market for this. But interestingly, some of my editors here that did some of my site checking in the various chapters here were homeschoolers. That is great! So I imagine they learn a lot as well since they are doing it then. Well, their mother tells me, I should say one family, that did a lot of the site checking here, they’re neighbors of mine. Their mother was one of my law students, actually. Although she’s not practicing law now but she’s an author herself. She said, “Talking about this at the dinner table, the kids would be excited about what they were learning,” and so on. And you know that’s one thing about when we look at history, too, is that for many people history– we think back to high school. How boring history was and it was boring because it was presented as simply a bunch of facts that don’t really mean anything and don’t really lead anywhere. But when you present history as the sovereign hand of God at work in human affairs. When you see that it has meaning and significance, then it comes alive. That’s what we’ve tried to do here. That’s great! In speaking of former law students that have endorsed the book, others– Justice Roy Moore has endorsed the book and talked about how the great information that’s available for all of us. And Colonel, hey it’s Christmas time. This would make a perfect Christmas gift, especially. Not only is it a really nice addition to the library but especially now after, as you said the election, and going into a new season, hopefully, in America’s history for people to take the opportunity and study this. So Christmas is coming up. I mean this is going to make a great gift for a lot of folks. They can get it from WallBuildersLive.com. This is a great time to get this out. And as I said I think it’s important to say, “Look, this not just for those people that are legislators are lawyers, though it would make a perfect gift for them. But this for anybody that really wants to know this history and more and more people are are getting interested in that.” I think your timing is great Colonel. I think this is needed in our culture today and hopefully be put to good use. Ancient Egypt Had A Gatekeeper. You know, last week I was up to Plymouth, Massachusetts and I got a tour of the Boston Commons and a tour of the John Adams Courthouse there and had a good talk with the administrator and chief clerk for the Massachusetts Supreme Court. We were talking about the problem that we have so often when people file a case with the Supreme Court in Alabama and elsewhere is that it sits there for awhile and then they find there’s some procedural defect and so they have to reject it. And by the time for appeal is run out so it can’t be corrected. Well, what I was telling him is that the ancient Egyptians had a system where they had a gatekeeper right of their court. And all of their pleadings in court were in writing. Anyway, when he would he receive that pleading, he would read it over. If it was procedurally insufficient he would hand it back to the litigants and say you need to correct this, this, and this and I’ll give you this many days to do it and then you resubmit it. Our courts could run so much better if we had a gatekeeper like that. And that’s just one example of where ancient wisdom can benefit us today. Oh man, and that’s an attitude of seeking justice. You know, not throwing things out because of some technicality but really wanting to get to the point of justice on this. This is what our court system is for. That’d be great to bring that attitude back. Exactly. I’ve been a staff attorney with the Alabama Supreme Court and I always found it frustrating that so many things had to be decided on procedural deficiencies rather than on the actual merits of the petition itself. Anyway, the Egyptians apparently saw that too. And like I say, the clerk of the Massachusetts Supreme Court was fascinated to learn about that possibility. Good stuff. Well, Colonel, thank you for doing this. Thanks for making it available. This must have been a lion’s share of your time over the last few years because this is almost a– this is kind of your Magnus Opus. Man, this all those years into one three volume set. Well, my wife says my problem now is I don’t know what to do with myself between 1 and 4 a.m. But yes, it was a lot of work, a lot of the late nights but it was a labor of love. Every chapter that I did on this, I became fascinated with it. I hope that helps make things come alive. That’s great. We’re looking forward to get in the hands of a lot of folks. I really appreciate your time today, Colonel. Thanks for coming on. And thank you, Rick. You and Dave keep on doing all you’re doing. You bet. We appreciate you being here! Stay with us folks we’ll be right back with David and Tim Barton. Hi friends! This is David Barton of WallBuilders. The current condition of education in America is abysmal. Not only is educational achievement plummeting, but every year, some 19 percent of high school seniors who graduate is completely illiterate. They can’t read at all but it was not always this way. For generations, we taught students how to think. But after the progressives took over education in the early 20th century things began to radically change. Education shifted from thinking to learning which made the emphasis on the teachers rather than the students. And that elevated indoctrination above knowledge. At that time progressives also made massive changes in the way we tested students. They extended school from 8 to 12 years. They introduced graded education and they added compulsory education. Statistics prove that these changes have harmed education rather than helped it. And now the progressives are pushing common core. On our new DVD on common core, we give you eight reasons why this current approach is so dangerous to our kids and our culture. We also show you an amazing history of education. So get this new DVD at WallBuilders.com. Well, we’ve got a special program for you available now called Constitution Alive with David Barton and Rick Green and it’s actually a teaching done on the Constitution at Independence Hall in the very room where the Constitution was framed. We take you both to Philadelphia, the Cradle of Liberty and Independence Hall and to the WallBuilders’ library where David Barton brings the history to life to teach the original intent of our Founding Fathers. 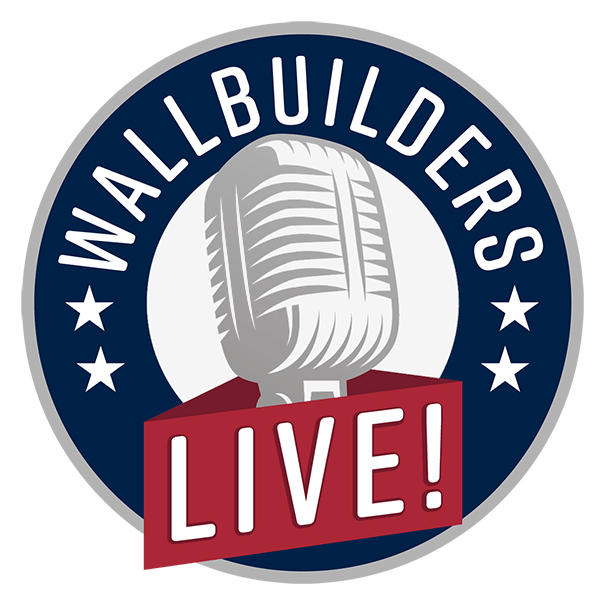 Thanks for staying with us on WallBuilders Live. We are back with David and Tim Barton now. Hey guys, wealth of information. In fact, not just great information, this is a great Christmas present. I mean this is a good thing to have in every home. Then he made the point that in all these cultures they were all looking to their deity for law. Only in the 21st century do you have this real secular approach. And he said, “That’s the aberration of history.” Whether it is the Cheyennes or the Mesopotamians or anybody else, it came from a deity from a higher source, from a god. And now to think that law comes from man. That’s a new thing and it’s not working out too well. You know, I just love the simple points he was making as he was going through and that’s the way the book is it’s really easy to understand and read. A great tool to encourage folks to get into. David like I was talking with him about, you shouldn’t feel a responsibility to learn these things only if you’re a lawyer, legislator, judge, or even a pastor this is the kind of stuff that every citizen we should want to know especially if you’re concerned about keeping freedom alive in our country. You got to know where it came from. what is the cause for the effect that we we enjoy today. He said, “That’s what we ought to be collecting in our library’s, museums, and preserving and keep that for the next generation.” And that really has guided so much of what we collect and keep, is what would you have to know to rebuild. And so this is something that every single citizen can know and understand. One of the positive things in the midst of that, Rick, you pointed out and he kind of acknowledged toward the end of the interview. We thought potentially our nation was going a direction that it was going to crumble, and how we’re going to have to go back, and how do we do this? But it looks like maybe God’s given us a reprieve, where maybe we have time now that we can go back. As George Mason said in reference back when they were doing the Constitution is that we have to get back to a frequent recurrence of fundamental principles. We have to constantly remind ourselves what it is we’re supposed to do and why do we do it and how does that work? And this is a great tool that now in the midst of if we’re going to be a free people, how do we do it? This is a great tool to go back and see this is where we came from. This is why we did what we did, and this is what was set up and why it was set up and we can learn, that so we can once again replicate what it is we want to do. To either regrow what we want to have produced in our garden so to speak or so we can maintain things that we want to make sure our continuing going forward. And a key word that Tim used there was reprieve because just because we’ve got a reprieve doesn’t mean we suddenly all know the principles and apply them. We still have to go back. We just have a little more time to be able to learn the principles and reinstitute them. And that’s what this book helps us do is get back to those fundamental principles as he said that George Mason talked about, the principles that make us work. It’s a great work, a great Christmas gift as well. Thanks to Colonel John Eidsmoe for joining us today. Thank you for listening. You’ve been listening to WallBuilders Live. Transcript of Colonel Eidsmoe’s presentation appreciated.